What we learnt at the JACC 2015 State Convention!! This past weekend, a large portion of The Skyline View staff attended the Journalism Association of Community Colleges or JACC. This was my second time at such an event; I have to admit I had gone into this event with jaded eyes. It’s safe to say I didn’t enjoy my first outing. I had originally gotten the air of muscle flexing and ego stroking. But I must say, my outlook on JACC has changed quite a bit. I’ve come to a deep understanding that this event isn’t just a bunch of people trying to show each other up. At its roots, JACC is a giant networking fiesta that allows aspiring journalists the chance to learn a myriad of tricks within the field, all while having the opportunity to meet new faces that they may someday work with in a professional setting. This past weekend marked my second experience at a JACC conference, and it was a mixed bag. On one hand, I met titans in the field of journalism. Some were kids my own age paving the way for what the future of the profession will become, others were the veterans sharing their decades of journalistic knowledge and experience with the throngs of hungry writers. On the other hand, there was this great whisper hanging heavy in everyone’s ears, a public secret that most of us dared to share but not take seriously. “I have no idea how you guys will make it,” one presenter told us, “but I’m certain that you will. Probably.” – Kel Munger. News reporting, as we currently define it, is changing so drastically that nobody knows how to advise us on what to do next. This has been my third JACC convention so far, and I thought that this past weekend was even better than last year. I came to Sacramento with more knowledge and experience with journalism compared to one year ago. From last weekend, I learned more about the how reporting news is changing, specifically through social media. Also, from a specific workshop about learning basic things journalists should know, the speaker George Medina gave advice about putting ourselves out there. According to Medina, if we were all really passionate about journalism, then we would all go out and try to find jobs by emailing, calling, or even just talking to people in this field. And he’s right. That’s the only way we’ll make it, and it’s ultimately our choices that make our dreams come true. I usually enjoy educational conferences, and JACC didn’t stop that trend. Seeing as I don’t know that many things, I love to learn about new things when I can. Meeting my colleagues in journalism at the community college level was radical. I learned about different aspects of journalism that I didn’t know anything about before the conference. Even if the contests were slightly scary, they presented me with knowledge about new tools I can use in my writing. Oh, and quality time with my fellow Skyline View mates is always a blast. I felt that this conference was successful and that I learned many things about journalism including on how to be successful at it. The event had many great guest speakers who were mostly lively and interesting. The workshops were fun to participate in and were a great time to pick professional journalists brains. It was great to see the other community colleges, also to get to look at their papers. This has opened my eyes to the possibilities on what I am to do with my major in journalism. JACC 2015 was my third trip on a three day journalism conference. I have competed a number of times in news writing and this time was the first I decided to be more laid back and try something different. I went with News Layout/Judgement and took a different approach: I would try my best and have fun. It worked and I was a finalist and ultimately placed third. While I learned to be easier on myself in competitions, I learned the opposite during workshops. Speakers emphasized the need to stay relevant and keep yourself in touch with the latest apps because that’s where our readers are. I had sort of an awakening to what the future of journalism will look like and it’s not going to be the reporting job at a daily like I had always wished. Those business models are falling apart and it’s on us to find what replaces it. It’s an exciting and intimidating time to be a journalist. It was my first trip to a JACC convention, and while it was exhausting and overwhelming at times, it was a much-needed source of inspiration toward the middle of the semester. Meeting other student journalists and gleaning wisdom from seasoned professionals and educators was a highly enriching experience, and has helped me to refocus and buckle down for the rest of the semester while thinking about journalism from a fresh perspective. It was my first time at JACC and I have to say that I have mixed feelings about it. It was a very educational experience; I learned a lot of tricks to multimedia and especially social media. But on the other hand, I was so drained and I essentially wanted to sleep for more than half of the day for the most part. The first day was horrible. Everything was starting late; it was so hot and all I wanted to do was rest. I felt so tired during the keynote. But I tried my best to stay awake, since Jason Wells made a lot of really good points. I also learned that BuzzFeed is a lot less annoying than I originally thought and that they are also a news publication. I always see the viral and “fun” things that go around instead of their news stories, which is why I had a different opinion of BuzzFeed originally. I think now that I know that they are also a viable news source I can rely on them for my news as well. I also became so much more active in social media thanks to JACC. My Instagram is starting to grow and I’m posting more often. Our Vine slowed down a bit, but I’ve figured new ways to garner more viewers. Our YouTube videos are getting better too, with new ways for people to find them. Between that and sharing articles across our personal accounts, I can see the rapid spread of our multimedia and articles coming about. All in all, JACC was a very positive experience for me, albeit excruciating. This is what it’s like to be at the news room on production night. We also ask our editors and staff writers a couple of questions about production. How’s it going, Skyline? I’m Miguel Garcia and welcome to another weekly roundup of the news brought to you by The Skyline View. That’s normally how it goes every Wednesday for me, hosting the news briefs(NB). I took on hosting last semester and I decided to continue it this semester. I’m actually enjoying hosting the news briefs (NB). I guess I just like being in front of a camera hosting anything, really. It was a little weird when I first started out, but after a couple of NB, when we finally got the format we wanted, it became natural for me. I’m not really sure who it started out with. It might have been with Nico. Anyway, carrying it on was kind of a surprise to me. I didn’t really think about doing it at first but then, I was the only one willing to, so here I am now. I enjoy talking in front of people and I like emceeing, so this was perfect for me. Because of the NB, I’ve considered majoring in broadcast journalism. I’m currently an engineering major but I can really see myself doing something like this, or radio, or television, way more than being an engineer. So how is it being the host of the NB? Well, I tend to screw up a lot. Thank goodness we never worked on a blooper reel, because I know I’d take more than ten minutes if there were to be highlights of my screw-ups. But even then, I still look forward to being on camera. Honestly, I never dressed to impress, but lately I have. Not only because I am trying to impress, but also because of the NB, I’ve been trying to look as presentable as possible every Wednesday. I mean, we switched the schedule a bit now, so I have to look presentable Mondays and Wednesdays now. I guess Will is doing me a favor this way. It’s really fun to be the host of the NB, honestly. I don’t know why people aren’t willing to do it. I just hope I can move on to something even bigger in the future. Who knows, maybe I can be a voice actor or a radio talk show host. I really like talking, but not just talking, also hosting and emceeing and all that. It’s really something I would love to do. Thanks to hosting the NB, I’ve found what I really want to do. Last semester was my introduction to the news world. I wrote articles, took pictures, yelled out punny ideas for headlines, and it was great. This semester however, my title has changed, and with it so have my responsibilities. Why, I assist of course. While the news editor finds stories, assigns them and edits them, I add an extra pair of eyes to the editing process and I focus entirely on the layout of the pages. Layout has been the scariest part of all this. As a technologically impaired person, learning how to move things around on a computer screen can be a frustrating and baffling process. And with the addition of never having used the program that we use for layout, some days can be more difficult than others. There is a very rewarding side to this all, however. Doing layout can be like painting; you get to start with an empty canvas and spend time seeing how you can make it into something appealing to the readers. There are so many analogies that I can compare layout to that depict the different emotions and gratification you get from it. At times, it’s like a puzzle, and you spend time fitting stories and pictures onto the page in the most appropriate manner. In other instances, it’s an analytical process of cutting and pasting obscure lines and boxes around a word-splattered page. Despite the frustrations that layout can cause, there is an evident feeling of connection that editors have with a page that they design. So much effort and personality can be put into designing a page that seeing the finished project treads on a thin line of joy and regret. The main thing I haven’t gotten used to is the critique portion of being assistant news editor. This is where the regret can come into play. We read over the paper in depth and find flaws or successes of the issue, and finding flaws on my pages is something I still haven’t adapted to. Errors, when found later, always feel like such unavoidable thing, so it can be really disheartening to see any on a page that I’ve done the layout or copy-editing for. However, each error that occurs has been a new lesson learned and an adaptation to make in future issues. This relates to my overall opinion about being the assistant news editor. Since becoming this, I have learned so much. 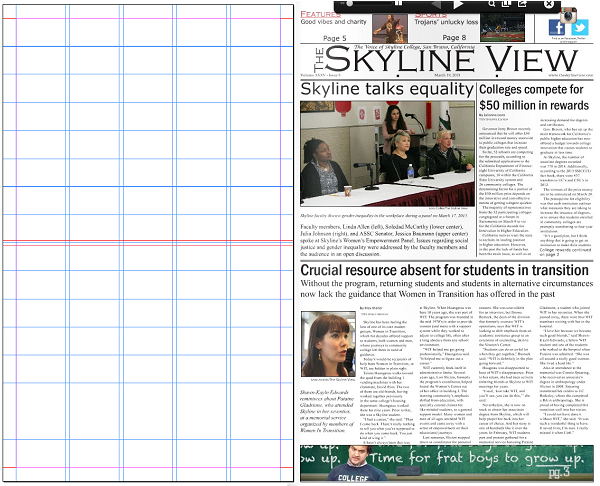 Each week I feel more and more confident working with the program to layout. And I enter each print production with a better understanding of how building a newspaper works. I personally think that putting yourself in situations that let you learn new things, especially hands-on, can only benefit you. And this position has given me that kind of experience. The best part about it is the variety of work I am getting to try out. It helps me see what I enjoy doing and compare it to the things that I don’t quite have a grasp on.